Crown Princess Victoria, 8 June 2013. Victoria, Crown Princess of Sweden, Duchess of Västergötland (full name in Swedish: Victoria Ingrid Alice Désirée, born 14 July 1977) is the heiress apparent to the throne of Sweden. On 19 June 2010 she married her former personal trainer, Daniel Westling. The couple has two children. 14 July 1977 – 31 December 1979: Her Royal Highness Princess Victoria of Sweden. 1 January 1980 – 9 January 1980: Her Royal Highness Crown Princess Victoria of Sweden. 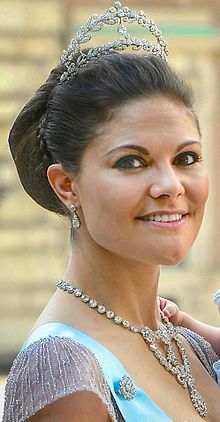 9 January 1980 – present: Her Royal Highness Crown Princess Victoria of Sweden, Duchess of Västergötland. This page was last changed on 27 May 2017, at 12:50.